An Amazing Scucecess : Collaborative Presentations (Video Clips) English Presentations NEW!!! International Collaborative Project designed by NFU students : Online Preparatory Stage, Outcome ,Collaborative Presentations. Participating Countries: Taiwan, Cambodia, Philippines, Malaysia, China, Korea, Indonesia. 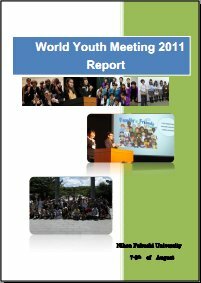 Copyright(C) 2012 World Youth Meeting All Rights Reserved.